Multi-purpose tie downs with protective buckle shield to protect both the vehicle and the cargo being carried. 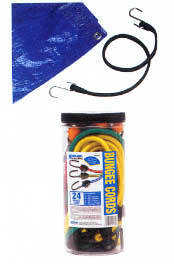 Triple Strength Bungee Cords are the finest stretch cords available. These patented products have high tensile strength steel hooks that are three times stronger than most conventional hooks. Hooks are coated so they won't scratch or mar. Color coded inserts quickly identify cord length. Standard Duty Bungee Cords feature molded hooks to prevent rust and corrosion; coated steel hooks have extra wide openings to improve fit and performance. Tarp Straps are engineered to outperform the competition in cut, tear and strength tests. UV-resistant EDPM rubber maintains strength and performance in all weather conditions. All ratchets tighten down with vise-like gripping power and hold securely mile after mile. Featuring Power Web Plus™ webbing. P.O.P. display packs included when ordered in multiples of eight. High quality polypropylene braided rope with common resistant zinc plated hooks. 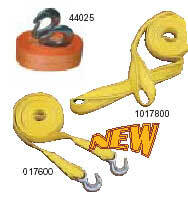 Unique, compact rope ratchet system secures a wide variety of items quickly and easily. Pull 'n Lok may be tightened as needed without stretching or tying knots. Simply hook ends and pull tight…it's that easy.